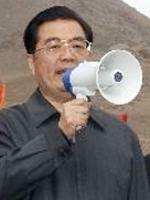 BEIJING, China, April 19, 2010 (ENS) – Chinese President Hu Jintao visited the quake-stricken area of the Tibetan plateau in northwest China on Sunday, pledging to help victims rebuild their homes. The 7.1-magnitude earthquake that struck the Yushu prefecture in Qinghai Province on Wednesday, followed by hundreds of aftershocks, has caused the collapse of most of the buildings in the city of Jyegu, burying many people. At least 1,706 people died in the quake and its aftermath and 12,128 others were injured, according to Sunday’s latest official tally. The devastating earthquake affected about 100,000 people in a 30,000 square kilometer area, the China Earthquake Administration said. Eighty percent of residents are homeless as their houses, made of wood and mud, have collapsed or are on the verge of collapse. At the primary and normal school in the city 115 teachers and students were killed. “There will be new schools! There will be new homes!” President Hu wrote in chalk on a blackboard in a makeshift classroom in a tent of orphaned students. 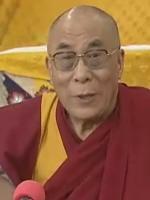 The Dalai Lama told reporters in a news conference on Saturday in Dharamsala, India that he himself comes from that area of Quinghai Province, and he feels very sad at the loss of life and property the earthquake has caused. But while Chinese officials have visited the area, it is unlikely that the exiled Tibetan spiritual leader will be permitted to go, as Chinese leaders view him as a potentially disruptive influence. “I also applaud the Chinese authorities for visiting the affected areas, especially Prime Minister Wen Jiabao, who has not only personally offered comfort to the affected communities, but has also overseen the relief work. I am very appreciative too that the media have been free to report on the tragedy and its aftermath,” the Dalai Lama said. Assistance should concentrate on education and health as the number one priority,” he said, urging the rapid rebuilding of schools and hospitals. 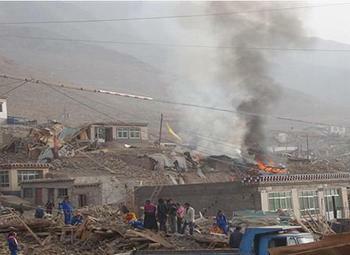 The earthquake destroyed the Yushu County Hospital and medical personnel have set up emergency operations in tents. The new Yushu airport has been reopened and injured people are being flown out of the area for treatment. Jyegu is hard to reach even under normal conditions. Damaged roads and traffic accidents have made it difficult for equipment and aid to reach the area. Local officials and aid workers say there is a growing shortage of food, water, blankets, tents and medicine. Monks have been distributing food from their monastery stores. The earthquake’s epicenter was in Rima, where the Ayang Monastery and a new Amitabha Foundation-sponsored clinic and boarding school are located. The Red Cross Society of China has allocated more than 2.8 million yuan (US$412,000) of relief funds and goods to quake survivors in Yushu. It includes 500,000 yuan of relief funds, 1,000 tents, 5,000 quilts and 5,000 cotton-padded clothes. Chinese disease control experts joined with armed forces on Sunday to begin large-scale disinfection of the debris and ruins of buildings in Jyegu. The disinfection is intended to prevent water pollution, marmot plagues and outbreaks of respiratory and intestinal diseases in the wake of the disaster, local authorities told the official news agency Xinhua. “The 7.1-magnitude earthquake increased the chance of a pneumonic plague outbreak spread by marmots,” said Jie Xuehui, a provincial official overseeing public health. Organized by the provincial agriculture and animal husbandry departments, six teams will work to prevent animal epidemics and assist with the disinfection work. Hundreds of technicians are at work repairing damaged power and water supply lines. Four days after the quake, street lights in Jyegu came on Saturday night, and officials said 80 percent of temporary shelters now have access to power which is being generated by a small emergency power station. More than 100 technicians are working at Changu hydropower station, the area’s major power generating facility, located some 15 kilometers to the northeast. Officials estimate it will take a week until damaged power generators are repaired and electricity from Changu is restored. Drinking water is being transported into the quake zone, and water technicians are repairing water pipelines in eight counties and hope to restore water supplies by April 20. The central government has set aside 4,600 tonnes of grain for the Yushu quake survivors, local authorities told Xinhua on Sunday. A spokesman for Qinghai provincial development and reform commission said the relief grain will be allotted to quake victims in Yushu free of charge according a standard of 0.5 kilograms per person daily for three months.